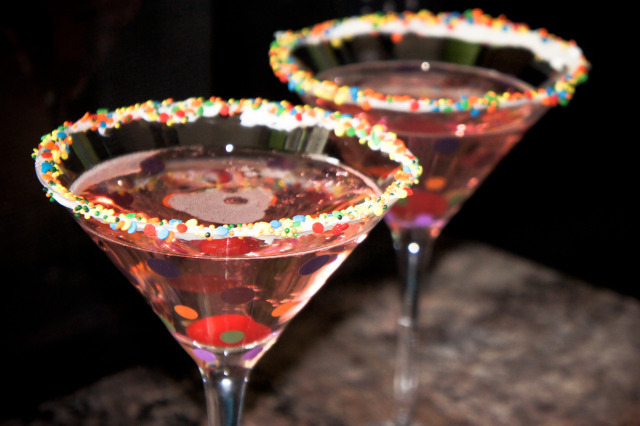 Rim glasses by dipping them in icing then in sprinkles. Combine vodka and cranberry juice in an ice shaker, half filled with ice. Shake well and strain into glass. Top with Champagne and drop in a cherry. NOTES: As with all of my recipes, MAKE sure your ingredients are gluten-free. FYI – Funfetti Pink Vanilla Frosting from Pillsbury is gluten-free. As far as the sprinkles go, most you see in the store should be gluten-free. The cherries are gluten-free as well and will probably indicate that on the side of the jar. A big THANK YOU to Pamasaurus at http://omnomalicious.wordpress.com for this great recipe!! Previous Post OK, So I know I Can’t Have Regular Flour….What Should I Use?